Woah woah woah. Where in the world did this race performance come from? Geez! I went into today's race just looking to enjoy myself and take it easy. Well, I did just that...but then...I also PR'd from last year. WHAT??? I can only imagine how I would've done if I actually raced this thing today! My time last year (same course, but snowing) was 34:17...this year, a 2 minute PR of 32:06. EEK! Then again, today's weather was absolutely cooperating with the race and it was so gorgeous out. But with my feet/hip being wicked mean to me, I wasn't going in with high expectations. Turns out, I felt great! No pain! In fact, I felt amazing, and I think it was all because I just needed to run in a race (it's been 3 months since my last one!). Ahhh yes. It was splendid. Travis and I nearly missed the start of my wave (the first) because the traffic coming off the freeway was horrendous. 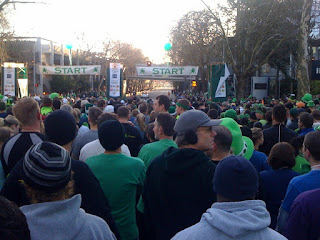 He dropped me off a couple blocks away from the start and I jogged my way to the crowd. It was quite the nice little warm-up too. Oh, and when I say crowd, it was just that and more...I could barely maneuver to get into the street for the start and kind of mini-panicked with a little claustrophobia induced attack. Wow. Not somewhere I wanted to stay. But when the horn sounded and we crossed the timing mats, it was a free-for-all...but this time, I didn't care. I wasn't racing. I wasn't jockeying for the best position or figuring out my next move. 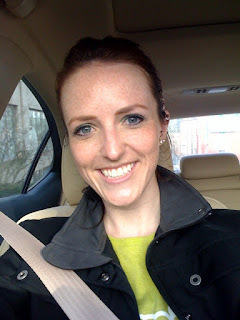 I was just smiling, listening to my tunes and just enjoying the ride. :) The whole time I was smiling and saying to myself: THIS is why I run. I love races. It's so much fun! Mt. Rainier on the way home...beautiful. Wow. Great job, lady!!! I love PR's! You look like you were having a great time!! You make me smile. I'm so proud of you. PS. When are we going to get you a runzoerun.com technical-t? Congrats Zoe! Nothing like a PR without even going for it! HellO! You look great in your matching outfit. Sounds like some fun costumes out there too! Awesome shirt. 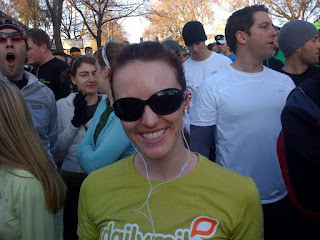 Dailymile should give you some free shirts so you can wear them during races. And now you get to prepare for another race. Can't beat that. How fun! Great race, congrats!! Awesome job Zoe! You look great in those pictures. Always making running look so easy! Congrats! Looks like we ran the same race yesterday! You rocked it, Zoe! Congrats on the PR! Great shots by Trav at the end! CONGRATS Zoe!! Did you color your hair?? Looks different. Way to rock it out. Love your outfit. go girl! Looks like you had a blast! And I friended you on Dailymile! I just joined this week. I love enjoying a race. They really are so fun. Looks like you had a ton of fun! Makes me want to enter races in Seattle in the future! Great job!! Glad you felt amazing~ now on to Mercer!! We need to meet up at one of these races! Love when that happens. Just out there running and all of a sudden you notice you're speeding along. Awesome! Congrats on getting a PR! What sunglasses do you have on? Great job! I'm so happy to hear the body cooperated! Love your pretty post-race happy face! Great race! Glad you felt good the whole time. Love the pictures and the outfit. Great job on the race! maybe you should run for run every time! Way to go Zoe!!! :) Amazing amazing job! You look so cute and I LOVE that you had such a great time at the race - that is what it's all about...races are so much fun! goodness Zoe you rocked it! You are looking tooo freaking cute too by the way! Love the visual of the other runners. congrats on the pr!! (and you weren't "really racing" at that) loved hearing about the sights at this race. Tht is such a cool feeling to just go out with the goal of having fun and PR! I *almost* did that once. Ran a 10K with just a goal to have fun. I didn't push hard or anything and missed a PR by 0.06 seconds!!!! Wayto go Zoe! Great race and congrats on the 2 minute (HUGE!!) PR! nice post! I just run last sunday (for 16k) and happy to see my new PR, you also look good on ur running gear! lookinf forward to your future post!